If there’s any local natural destination that can challenge Sarasota’s award-winning beaches, it has to be Myakka River State Park. For more than 80 years, the park has offered citizens and visitors a welcome antidote to the developed coast. The park, now more than 58 square miles, forms the nucleus of 110,000 acres of protected land called Myakka Island. As the heart of this visible-from-space “Island”, the management of Myakka Park is paramount and the Park’s management plan (called a Unit Management Plan, or UMP) is now being updated. Part of the process involves updating facts and figures, but it also includes prescriptions for the future of the park. And after decades of love, the park is showing signs of wear and tear. Visitation keeps increasing while staff levels have dropped, which diverts staff from managing/restoring the natural resources to unclogging toilets or officiating road rage. The Concession Area at the Upper Lake can have more parking problems than Walmart on Black Friday. The UMP recommends improvements to address many of these issues, including a new visitors center. But the proposed changes to the plan also include efforts to generate revenue by harvesting natural resources from the park and that eyebrow-raising proposition is making many Myakka Park lovers nervous. You may remember a recent effort to allow cattle grazing in the Park. Not a small herd of historic Florida Scrub cattle such as may be seen at Kissimmee Prairie State Park, but a commercial cattle operation south of Highway 72 in an area of globally imperiled dry prairie habitat. Public outcry (and the fact that it didn’t make much sense) led to cattle ranching being taking off the table. But timber harvesting, fuel and stump harvesting, and palm frond harvesting are now all being proposed, not as a form of management, but as a potential source of revenue. Former employees and others familiar with Myakka Park don’t believe these could ever produce much revenue, but they do represent a foot in the door for future commercialization of not only Myakka Park, but all 174 state park units. Advocates for this new extractive, consumptive revenue generation scheme point out some pines or stumps may need to be removed to reach legitimate management goals and the revenue generated through their sale could be ploughed back into park coffers. They would like you to believe this is a valuable source of income, but most of the stumps and pines are too scattered to attract bidders. And the remaining pines that might yield actually some money won’t do so for another decade. So these resource harvesting schemes aren’t about generating revenue, but in opening the door for the public’s park resources to be exported from the park for private gain. How can I tell? Because of those dang palm fronds. While there may occasionally be legitimate management reasons to remove pines or stumps, there is no known management goal served by cutting green fronds from our state tree, the cabbage palm. So the inclusion of palm frond harvest is functionally equivalent to the park selling Spanish moss, or mistletoe. Heck, they might just as well sell rights to take bromeliads or native orchids. It furthers no management goal at the expense of depriving the public of their right to see natural Florida. So these meager harvesting schemes are just a foot in the door for more ominous extractive schemes in the future. Myakka Park already generates more money that it costs to operate (although more should be spent on operation). If increasing income was the real goal, modest adjustments such more competitive charges for RV camping or seasonal campground pricing would generate far more money. And remember that Amendment 1 we passed? Manatee and Sarasota Counties are sending $35 million a year to Tallahassee and some (not a lot) has been coming back to aid in Myakka park restoration efforts. Is it too late to challenge this radical change? No. The Division of Recreation and Parks will be holding an “Open House” hearing at the Suncoast Community Church Activity Center, 8000 Hawkins Road, Sarasota, Florida 34241 Thursday, March 2, 2017 from 5:00 to 7:00 p.m. I’ll see you there -- with my palm frond. Jono Miller, a longtime Sarasota community leader, is a contributing columnist (and cabbage palm expert). 1. T. Mabry Carlton Jr. Memorial Reserve is the full, name, often abbreviated CMR. Call 861 5000 for information or view the Land Management Plan. 2. CMR, the Carlton fee parcel, and the Walton tract are 3 separate parcels. 3. Prairie and savannah describe restored habitat in Myakka River State Park, north of the Carlton Reserve. 4. Carlton Birding list indicates the seasons when sightings occur. Frequently seen are vultures, red-shouldered hawks, kestrels, egrets, jays, cardinals and crows. Not commonly seen are loons, pelicans, caracara. Burrowing owls are not seen in the Reserve. 5. Hayrides have been curtailed due to staffing cutbacks. 7. Volunteers played no role in the donation, storage, or reassembly of the historic visitors log cabin. They have spray sealed and re-chinked the logs several times. Volunteers also helped restore the original Windy Sawgrass Camp cookhouse, bunkhouse and stable, constructed a 12 stall pole barn for equestrian use and help maintain markers and trails also used as firebreaks. 9. While they helped research the history of trails and land use prior to public ownership, volunteers played no role in the placement of wells or use of the Reserve as a water utility. 10. Because some areas are reserved for water utility use and others are managed as preserved natural land, the Carlton is referred to as a reserve. “Wily Coyote” makes headline news! The Friends of Carlton Reserve received a $510 grant from Microsoft Corporation to match employee volunteer hours. Drew Schell and Julie Scherer from California are native plant experts who vacation regularly with family in this area. Each year they donate their vacation time on public lands, assisting national, state and county land managers with plant surveys and identification. Then Drew's employer, Microsoft, matched his volunteer hours with a monetary grant. Thank you Drew and Julie for these extraordinary services! 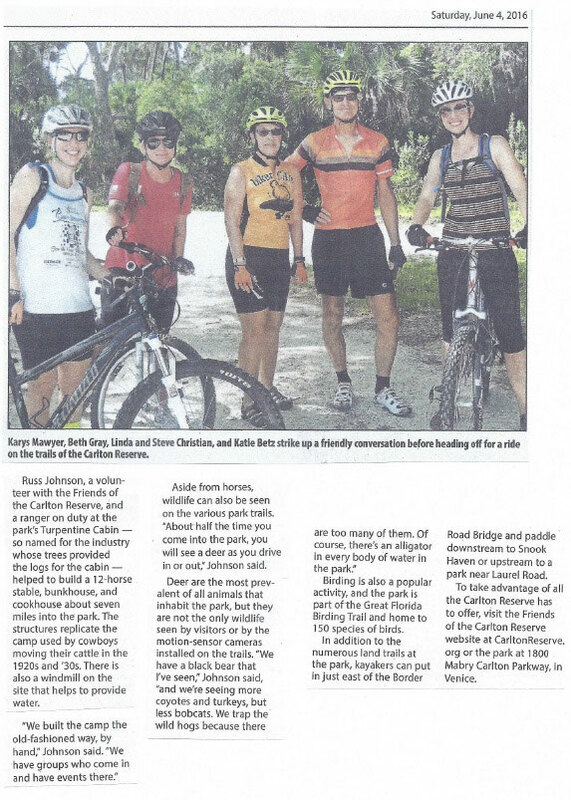 Congratulations to the Friends of the Carlton Reserve (FOCR), our Share the Road club of the month! As budgetary cuts continue to impact Florida's natural public lands, volunteers are more crucial than ever in protecting our natural wildlife. As stewards of the T. Mabry Carlton Reserve, the Carlton volunteers are committed to maintaining and promoting the conservation of this Sarasota treasure. With approximately 25,000 acres and about 90 miles of trails, volunteers work hard maintaining the Reserve's trails alongside the area's land manager. 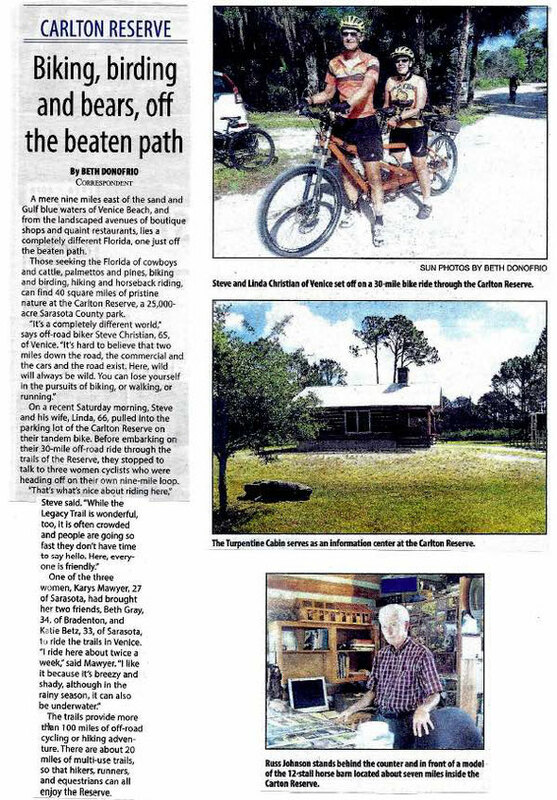 The County volunteers guide several monthly bike, birding, and kayaking events, as well as maintaining the visitor's cabin. 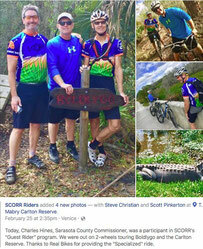 Florida Trails Association brochures available on line.